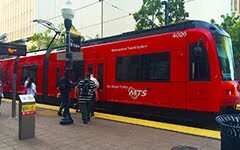 Free Public Transit So Cal: Global warming calls for dramatic action. Abolish the private auto. Global warming calls for dramatic action. Abolish the private auto. Transit Riders for Public Transportation: "The urgency and magnitude of the global warming crisis demands a scale of cuts in greenhouse gases that defies the imagination. The United States is one of the world's largest historical greenhouse gas emitter and must reduce its emissions by at 60% immediately on the way to a 90% cut by 2050-based on 1990 levels. With the U.S. emitting 45% of the world's automotive greenhouse gas emissions, can we envision moving towards a 90% reduction in U.S. greenhouse gases by virtually eliminating the auto and replacing it with a nationwide system of public transit?"